The writing of the courtesy name Yunting here is the form that caused this patron to be called ‘Li Junting’ in our earlier publications on the Yangzhou school of glass overlay. See Sale 3, lot 92 for the standard way of writing his courtesy name. 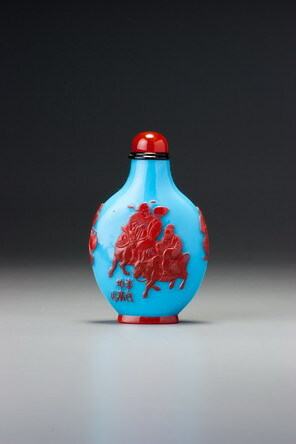 We now know that Yunting was the courtesy name of Li Peisong, who moved from his native Dantu to Yangzhou around 1870 and, with his brother Li Peizhen (Weizhi), had several glass-overlay snuff bottles made bearing dates (when dated) from 1877 to 1881. Li Peisong was an official (perhaps by purchase), a businessman, and a philanthropist. He was not a glassmaker; the inscription here indicates that he caused the bottle to be made. For details on the Li brothers, see Moss and Sargent 2011. Having been mildly disparaging about this obvious masterpiece, let us turn our attention to its many finer points. The subject matter, although not unique for the school, is rare and quite delightful, featuring a team of well-trained demons performing menial tasks for their master, Zhong Kui. Another sign of the high quality of this bottle is reasonably good control of the overlay colour on the footrim, which, while appearing faultless on the outside, bleeds into the foot inside the footrim. The footrim here is also well controlled, but not to the same degree as the best made for the Li brothers (see Sale 2, lot 76). The composition is well balanced and powerful, with confident use of a strong contrast in colours, and employing demons to replace the usual handles is a delightful feature.